When the Patriots acquired Cordarrelle Patterson in a trade with the Oakland Raiders, they knew they were getting a very good kick returner with insane speed. However, that isn't exactly the role anyone thought Patterson would be playing just five years into his NFL career. Once thought to be the next big thing as a wide receiver, Patterson has yet to live up to that hype. Patterson said once the trade was completed, he and Belichick talked about his role with the Patriots. Belichick made him a promise. “We get the job done here. 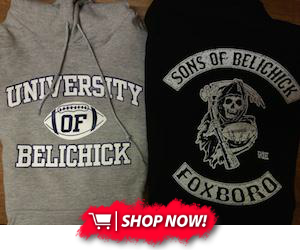 We’re gonna make you the player you should be,” Belichick told Patterson. Of course Belichick values what Patterson can bring on special teams, and it wouldn't be at all surprising to see him returning kicks frequently next season. With Danny Amendola and Dion Lewis gone, Patterson is the only reliable kick returner New England has. But it seems like Belichick has much bigger things planned for Patterson. With the Patriots deep at wide receiver, it will be interesting to see how Patterson is used.